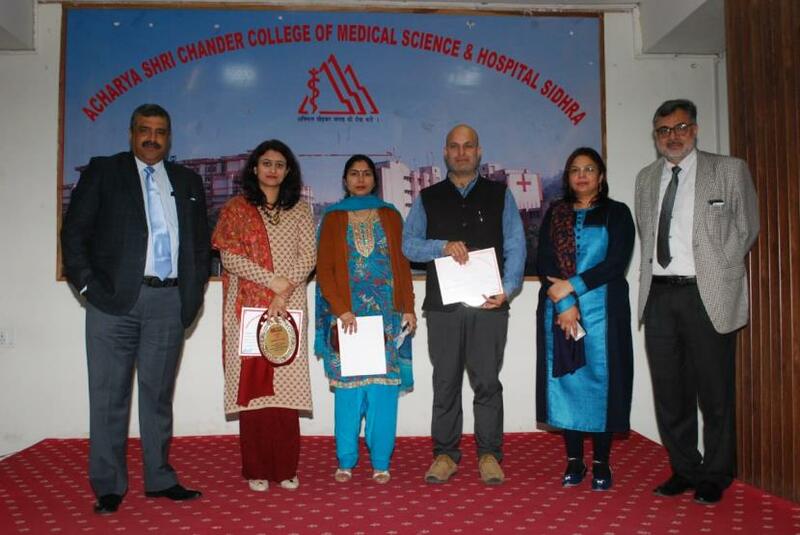 JAMMU: A Continuing Medical Education (CME) on implementation of new medical curriculum was organized in auditorium of ASCOMS and Hospital, Sidhra, Jammu. As per the guidelines governing IMG Regulation 2019 the new curriculum has to be adopted by all the medical colleges across the country. The new curriculum is more of objective then subjective one. The drastic changes have been suggested in new curriculum which is going to be a competency based and new teaching learning method has to be adopted in the aforesaid curriculum. Dr Rajesh Kumar Gupta Prof and Head Orthopaedics and Co-ordinator of MEU, ASCOMS & Hospital while introducing the speakers and the topics laid stress on various important aspects of new curriculum. He also elaborated on the role of the teachers in adopting this curriculum. Dr Meeta Gupta, Dr Jyoti Kohli, Dr Shalini Sobti and Dr Ajay Puri also spoke on the occasion. The function presided over by Dr Pavan Malhotra, Director Principal, ASCOMS and Hospital who in his key note address informed the gathering to become proactive while finalising the teaching module in their respective subjects. He also informed that very shortly Departmental Academic Committees will be formed and the faculty members will be nominated to Joint Academic Committee and this nomination will be sent to Dean Faculty of Medicine for approval and subsequent finalization of the curriculum.